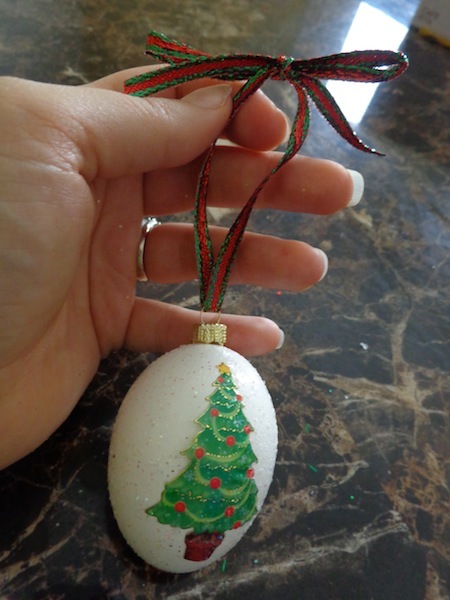 One of my favorite ornaments on my talking Christmas tree is an egg ornament that I made and have had since I was a child. 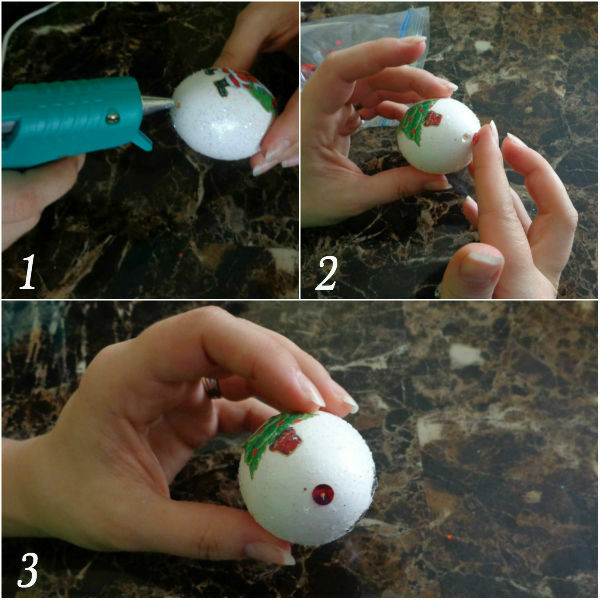 I’ve always wanted to recreate that ornament and this was the year I set out to make DIY egg ornaments! This is definitely a project that’s fun for the whole family…big and little kids alike. Although, if you have little ones, I’d recommend that you already have the eggs blown out and ready to go before they join in the fun! 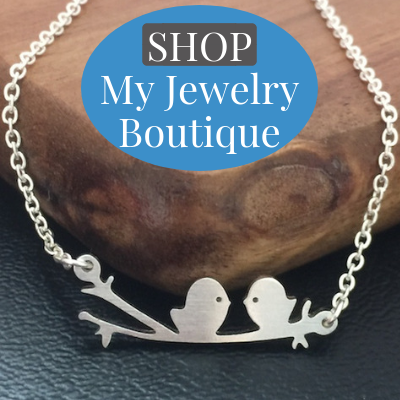 I had a few of these items on-hand (and you probably do too)! Other than the Blas-Fix (which I bought on Amazon), I bought the rest of the items at our local craft store when they were half off. The Christmas stickers were tricky to find because they weren’t with the Christmas items (go figure). They were with the rest of the craft supplies. 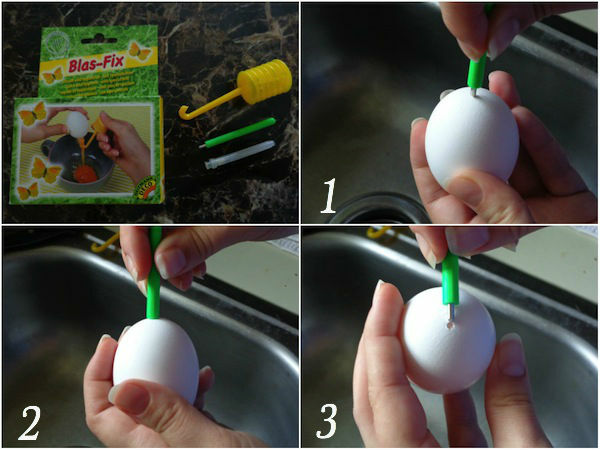 The Blas-Fix is such a neat tool and blowing out the eggs wasn’t as hard as I thought (once I got the hang of it). Place the tool at the center point of the egg. While gently pressing down, turn clockwise, then counter clockwise until the hole is made. 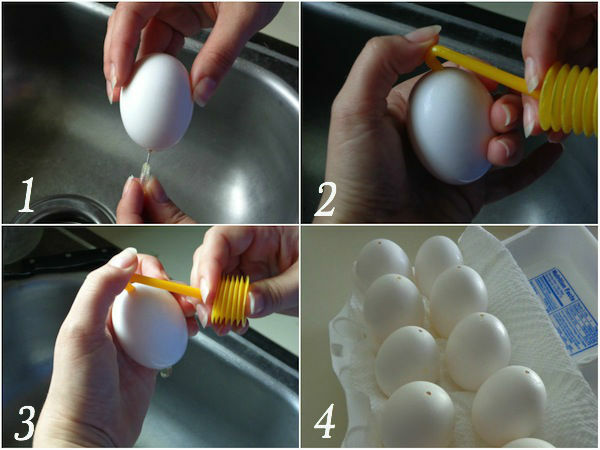 Repeat to make a hole on the opposite side of the egg. Note: I had a few eggs that cracked once the hole was made. 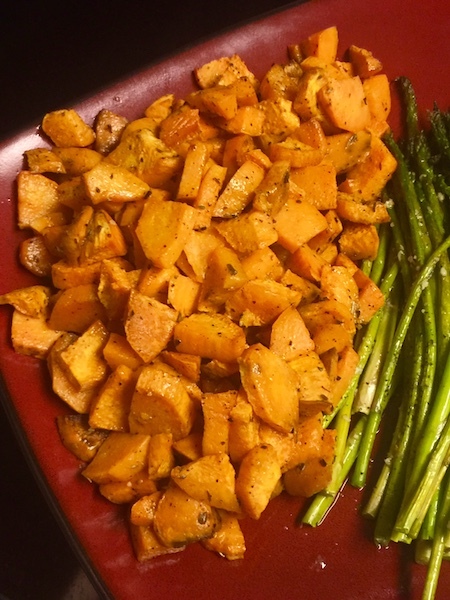 If you want to make a certain amount of eggs, make sure you have extra on-hand. While holding the egg vertically, place the blower tool over the top hole, cover with your thumb (but press lightly) and pump out the egg. It may take a few tries before the egg finally starts to come out so don’t get frustrated. (You may need to use the needle to break up the egg some more.) Once you’ve gotten some egg out, shake the egg to break it up even more, repeating this process 2-3 more times if needed. Place your egg under running water to thoroughly rinse it out then place it on a paper towel in the egg carton. It’s best to let the eggs sit overnight to thoroughly dry. However, if you don’t have time, you can also blow out any additional water with a hair dryer. This is where the magic and creating begins! 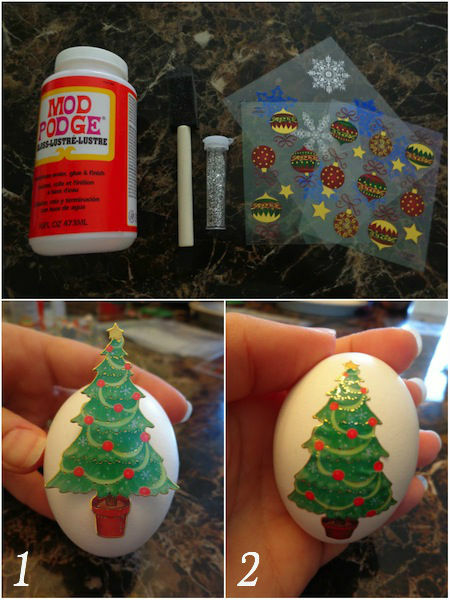 Let your imagination soar and decorate your eggs with stickers (or the items of your choosing). Note: I purchased large stickers and they were a bit hard to work with. Although you can’t see it very well in the pictures, there were a few air bubbles and some areas of the sticker did not want to stay down (I hot glued those parts later). They weren’t perfect, but I think they still turned out cute even with their imperfections! All that to say, if you’re making these with little ones, small stickers will work best for them. Note: While you can use any color sprinkles, I found that the clear glitter looked the best. 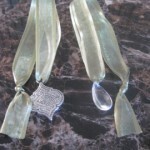 I’m going to switch gears for a minute and talk about the ornament hangers I used. 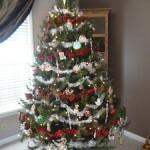 I purchased small store bought ornaments and removed the ornament hanger. Note: I bought my small ornaments at the craft store. 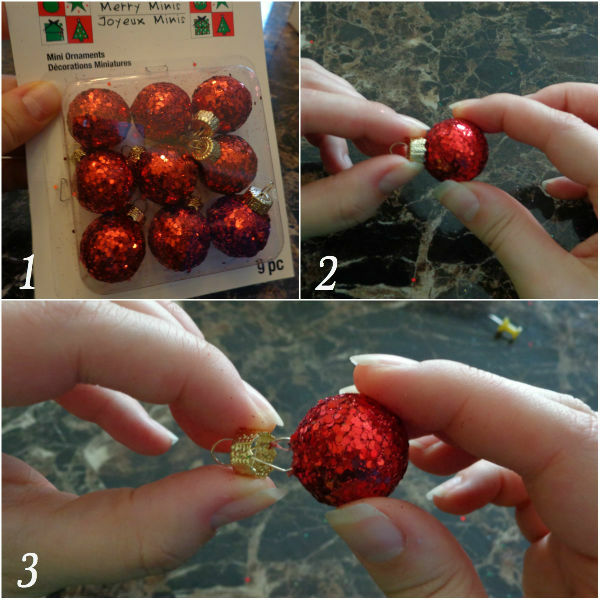 It’s quite possible that you might be able to save even more by look for small ornaments at the dollar stores. 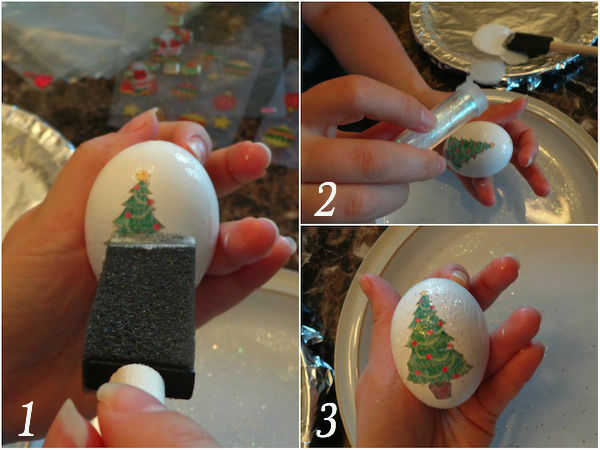 Okay, no back to creating our egg ornaments! Loop your ribbon through the hanger and tie. 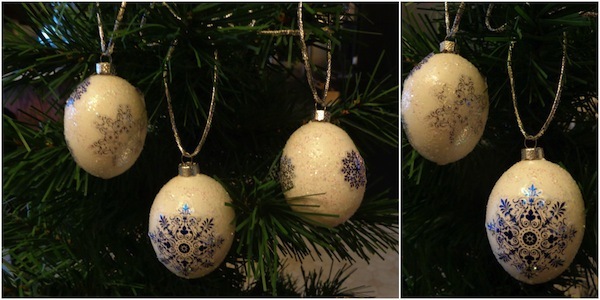 And there you have it, your very own egg ornaments! Aren’t they just adorable? As you can see, the sky’s the limit on decorating your eggs. No matter what you choose, have fun with it and make each egg your own! Love this! I’ve always wanted to try blowing out eggs. You make it sound like I could do it. Don’t forget to keep your egg carton for storing your ornaments when the come off the tree. And thanks for the reminder about keeping the egg carton! 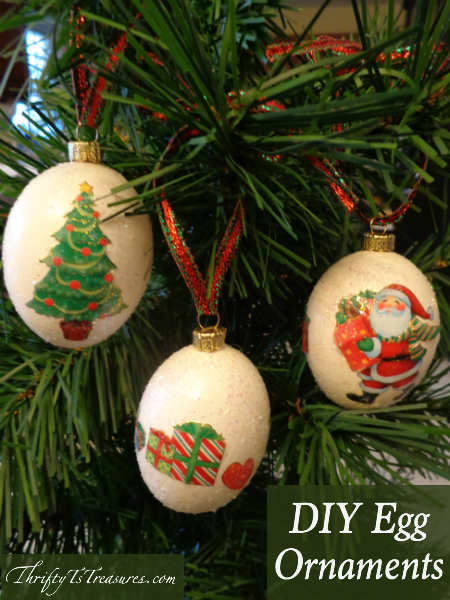 These egg ornaments are really neat!! Great tutorial!! Thanks Keri! 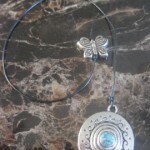 You’ll have a blast making them! 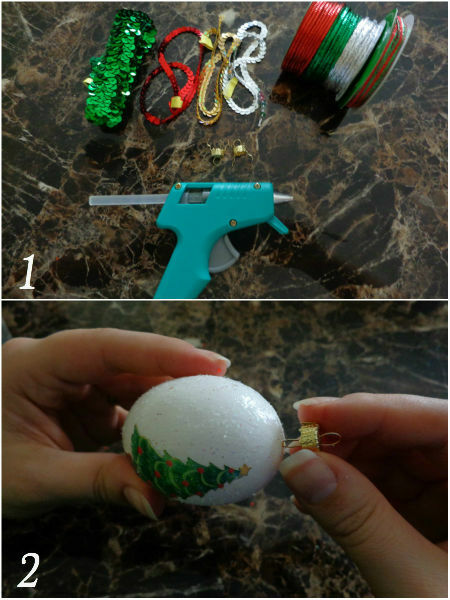 These egg ornaments looks adorable :)Thank you for sharing with us at #HomeMattersParty . We would love to have you again next week. 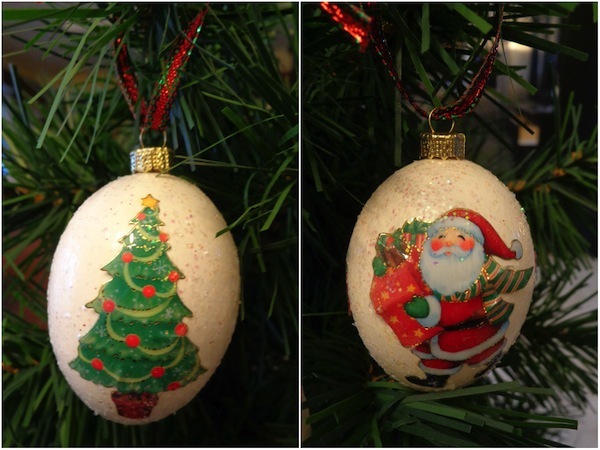 My sisters and I each had an egg ornament when we were little. To this day, it’s one of my favorites.